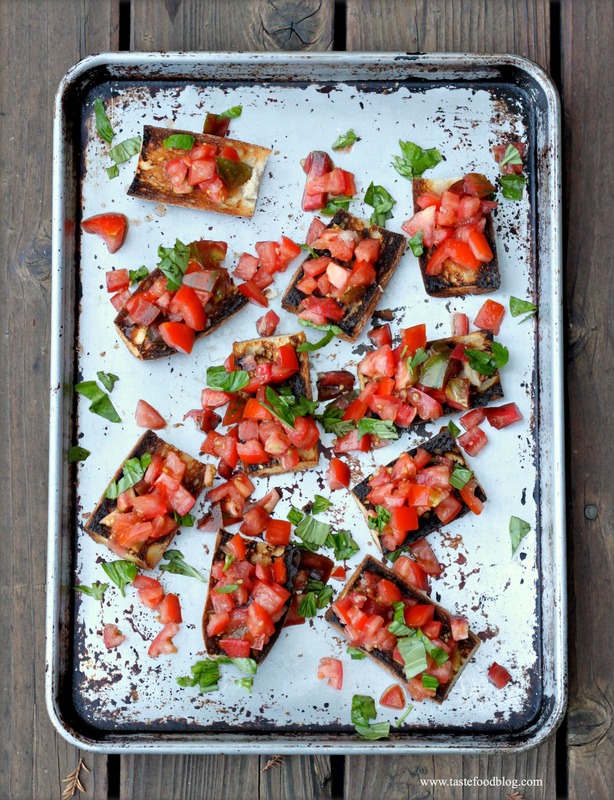 When I make tomato bruschetta, my family always says, “Summer food!” And so it is – especially when it’s made on the grill. Everything happens on our grill year round, I mean, during the summer. For this recipe slices of baguette get all toasty and charred on the Weber. Believe me, it’s worth the step for the flavor and saves you from the heat of the oven broiler. The grilled bread is then smothered with fresh chopped tomatoes infused with fresh basil from the garden, garlic and a glugg of olive oil. So simple, so good. If you could have summer in a mouthful, this would be it. I like the rustic presentation of halved baguette sections. Alternatively, slice the baguette on the diagonal 1/2-inch thick. Serves 4 to 6. Cut each tomato in half, and scoop out the juices and seeds with your fingers or a small spoon. Cut the tomatoes into 1/4-inch dice and place in a bowl. Add 1 minced garlic clove, the olive oil, basil, 1/2 teaspoon salt and 1/2 teaspoon black pepper. Gently stir to combine and taste for seasoning. If you don’t have super sweet tomatoes yet, a pinch of sugar may be added. Cut the baguette crosswise into 3-inch sections. Halve each section lengthwise. Grill the bread slices until toasted, turning once. Arrange on a platter cut-side up. Peel 2 garlic cloves and slightly crush with a knife. Rub the garlic cloves over the bread. I haven’t found any good tomatoes yet this season – when I do, this will my first “summer recipe”. Lovely bruschetta. I’ll have to grill the baguette next time. Sounds lovely. Very impatiently waiting for tomatoes to come into season locally! The Bruschetta is just the type of recipe my family craves, outstanding on the grill! Your bruschetta looks fantastic! Light, fresh and so summery! Summer in a mouthful….Amen, sister!